Many people in the US use auto shipping services to transport their vehicles, whether domestically or internationally. There are a number of documents that have to be exchanged between you and the auto shipping service provider when you wish to ship a vehicle. One such document is the Bill Of Lading, which serves as a legal contract between you and the auto shipping services provider. The law requires a Bill of Lading for auto shipping to be prepared by the auto shipping company, with the shipper and the driver hauling the shipment keeping a copy each. Though people with prior auto shipping experience know what a Bill Of Lading is, first timers need to learn about the purpose and criticality of the document during auto shipping. This post discusses, in detail, essential contents of the Bill of Lading and what shippers must check when signing the document. The header section on the Bill of Lading contains general information about the auto shipping company. You can find essential information such as the name of the company, legal address, valid contact number, and details of the driver hauling your vehicle. Emergency contact information is also mentioned in the header section; however, it can also be found elsewhere in the document. The section also includes information on other motor carriers, if any, participating in the hauling activity. Essential information on the vehicle being shipped is also documented in the bill of lading. It mainly includes the year of manufacture, make and model, color, license plate number, fuel economy, and the Vehicle Identification Number (VIN). The information helps ensure that the vehicle being shipped by the auto shipping service provider, is the same that is delivered to your desired destination. Before an auto shipping service provider hauls your vehicle, it is duly inspected, as mandated by federal law, and all physical damage noted on the bill of lading at the time of shipment. You must go through the information on the vehicle’s condition to ensure that damage details, if any, are not over or understated. 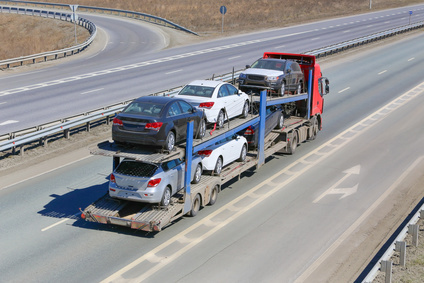 If the damage mentioned on the Bill of Lading is the same during the inspection post delivery, it indicates that the car shipping company has performed a good job of hauling the vehicle and no damage was suffered during transit. In the event of any deviation, inform the auto shipping company without delay. Understanding the shipping terms and conditions is crucial when you go through the Bill of Lading, especially when the shipment is booked through a third-party or broker. In such instances, the terms and conditions are likely to be different for the broker and the actual company providing the auto shipping services; necessitating the need to read and understand both provisions. Once you go through the terms and conditions, you know what to expect from the shipping service provider, including what’s covered and what’s not. Understand all money-related clauses, including the mode of payment, advance payment, and actions that may invite penalties. As an auto shipper, you need to be in possession of the Bill of Lading before the auto shipping company picks up your vehicle. You and the truck hauler are required to sign the Bill of Lading before initiating the auto shipping process. By signing the Bill of Lading, you agree to the contents of the document and indicate that you have no concerns. It is, therefore, important to meticulously read the information in the Bill of Lading before signing on the dotted line to avoid any issues. If you are looking for affordable, on time, and professional auto shipping services, EasyHaul can help. We provide both open and enclosed carriers to safely ship your vehicle to any destination in or outside the US. To learn more about our auto shipping services or discuss your requirement, fill out or contact form. You can also give us a call at +1 (360) 597-9320.